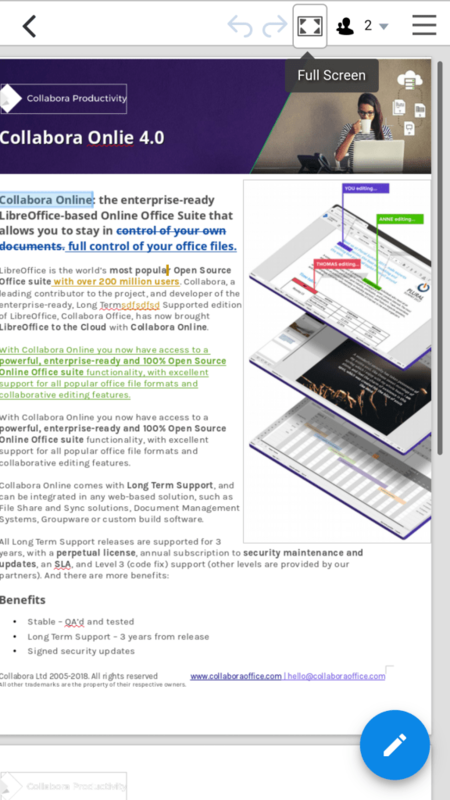 Cambridge, United Kingdom, February 14, 2019 – Collabora Productivity, the driving force behind bringing LibreOffice to the cloud, is excited to announce a new, major release of our enterprise product Collabora Online 4.0. This release includes a fresh look, mobile improvements, improved interoperability, new dialogs and functionality as well as a raft of bug fixes and polish. 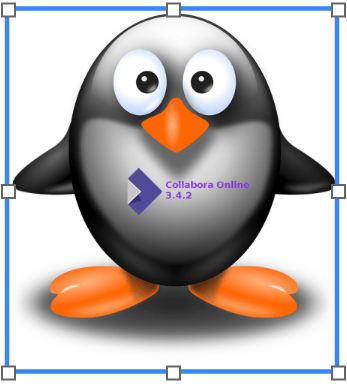 At the same time as our release we are updating the Collabora Online Development Edition (CODE) for home users, and to make it easy for everyone to try this out and get involved with integrating it into their systems. For more information please visit CODE’s page. 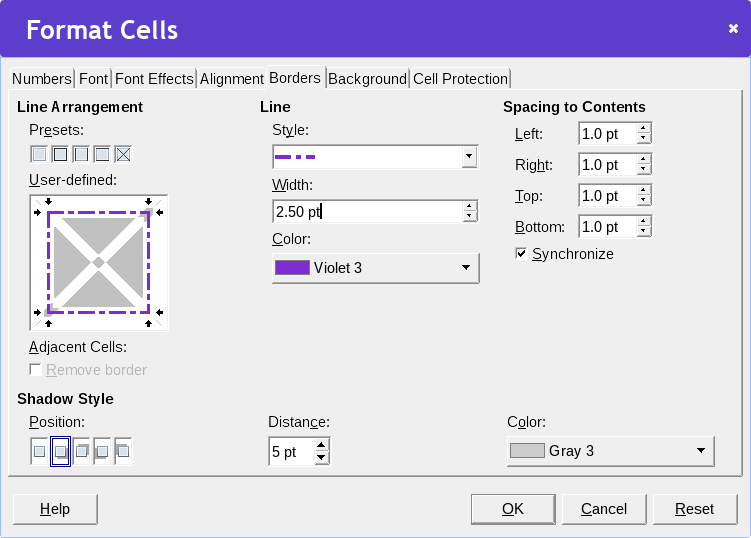 This release includes a fresh look – with improved toolbar colors and layout, mobile improvements – with support for Retina and HiDPI screens along with easier shape editing, as well as improved interoperability provided by upgrading the underlying document rendering core to Collabora Office 6.0. In addition, we introduce support for Vereign’s blockchain-powered platform which provides Collabora clients with an authentic identity management solution as well as bringing more of the rich dialogs of our core engine to users. Toolbars have been refreshed to integrate the Colibre icon theme (thanks to Andreas Kainz) and lighter coloring, which significantly improves the look of 4.0. Compare before and after. In addition, a new icon to hide the menu bar is now present. It further simplifies the UI. 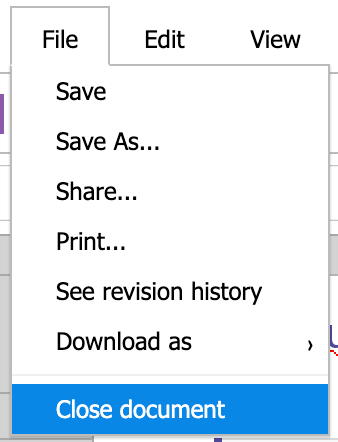 The document file name – which you can click-to-rename – has been tucked into the menu more neatly. Further, a ‘click-able’ modification time – which when clicked launches the revision history – has been added. 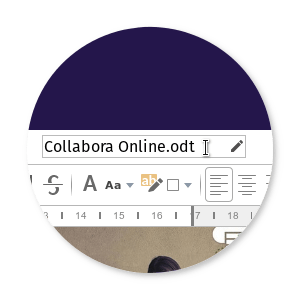 While Collabora Online can be used as a software component integrated into a variety of products, these improvements to the visual design have been developed in close partnership with Nextcloud. Vereign is a Swiss open source company building a blockchain based self-sovereign identity and personal data store. It can be hardened to Swiss banking standards. They are currently running a beta program to add authentic communication to e-mail, starting with Gmail and Roundcube. Collabora has partnered with Vereign to also provide authentic documents bearing the qualified electronic signature of your hardened self-sovereign identity. The document_signing_url configuration key in loolwsd.xml will be pre-set to app.vereign.com for future CODE releases, as/when the API is stable. However Collabora Office users will need to enable this integration explicitly if they want it. If you are already signed up with the Vereign beta program, to send authentic email with your Gmail account, your self-sovereign identity and its passports will be immediately usable for signing documents in CODE 4.0. Use the File → Sign document menu option to activate the ‘Vereign Toolbar’ to log into this service. 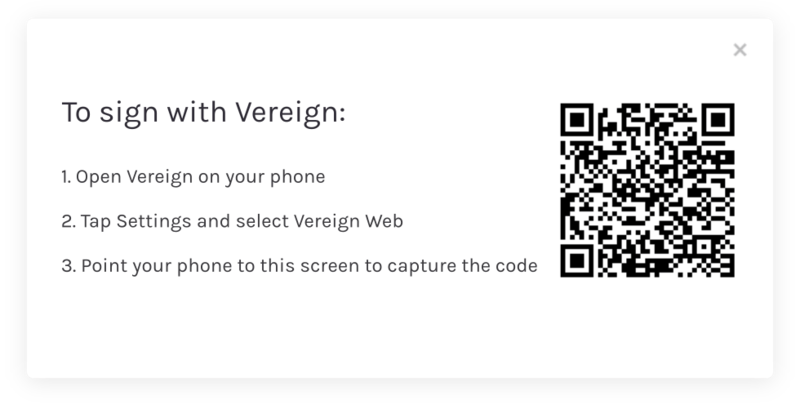 For the users who are accustomed to using the Vereign app, we have created a QR code dialogue so as to speed up their log-in process. Vereign also supports storing – and later publishing – copies of signed documents to provide you with an independent, user owned archive of your interactions. This archive is blockchain secured, as is the audit trail of all your identity interactions. Vereign is currently gathering interested parties for Proof of Concept (PoC) deployments next year and partners with potential use cases are encouraged to contact Vereign directly. 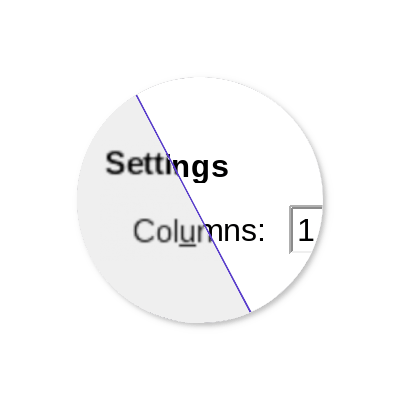 To make shape editing much more pleasant, and more helpful for touch users we have enlarged the size of the selection handles and made them circular. We have also added a more convenient and familiar rotation control to avoid needing to use the shape dialogue to rotate objects. We have also added a more convenient and familiar rotation control to avoid needing to use the shape dialogue to rotate objects. Rotation control added to shape dialogues. 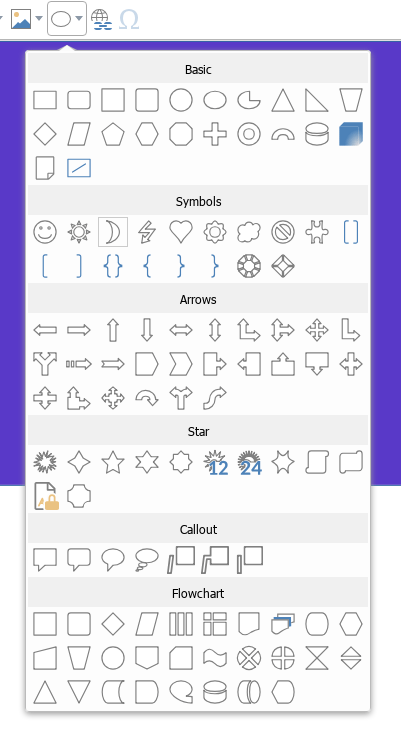 In addition to make shape insertion easier we added a palette of all the built-in custom shapes allowing easy insertion of new shapes into the document. Mobile device support has improved significantly in this release in a number of critical areas. 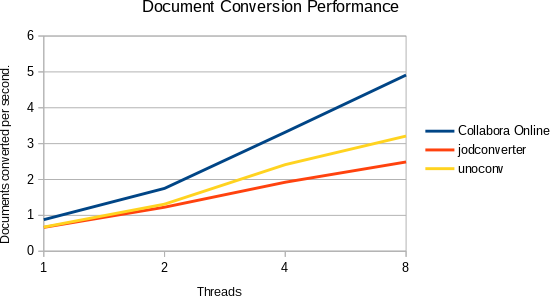 Time to first document load is improved – though it has always been possible to load, layout and calculate large and complex documents on the server – avoiding complexity and battery life impact on a small mobile device. We have introduced a simple, stripped down viewing mode at first, to make it easier to view documents in an uncluttered way. Toolbars are easier to use, can auto-hide, and scroll to allow a wider selection of commonly used functionality. The menus are also far easier to scroll and interact with deeper menu hierarchies. 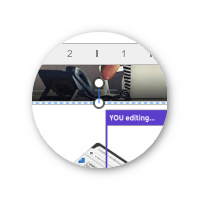 Pinch to zoom, pan, and other multi-touch behaviors are also improved, along with the ability to zoom and pan into different areas of complex dialogues allowing the full rich functionality of the desktop designed dialogues that are larger than a mobile screen to be used conveniently. Improvements to the special character dialog making it easier to use favorite characters in 4.0 are also visible here. This has a significant effect across all components, and particularly Calc which now has a 200% zoom option. 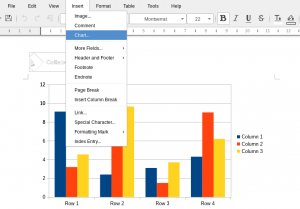 By avoiding the browser needing to do a local scaling, we get much crisper text, and conditional formatting, as well as using your display to best effect. We also moved to using scalable vector Colibre icons for dialogues, and rendering these at a higher resolution when needed too. 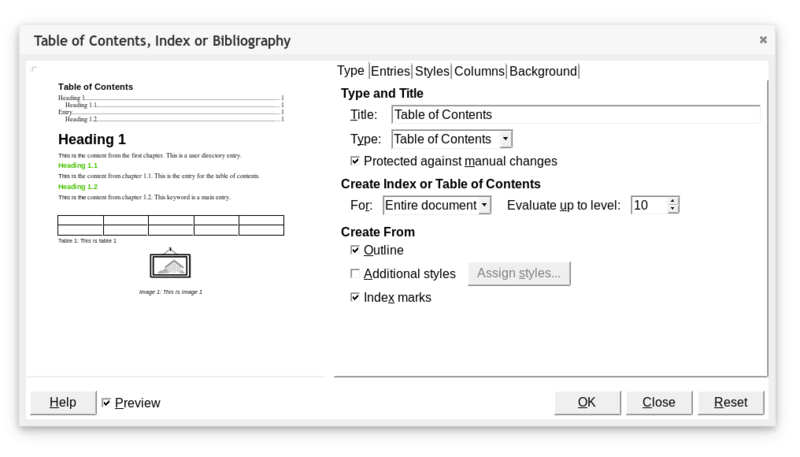 This feature provides users with the possibility to configure the attributes of sections of a Collabora Online Writer text document. For instance, a user can restrict editing to specific parts by locking certain sections of the text with a password in order to protect sections, perhaps legally sensitive, of a text from being changed. Users can now insert powerful Tables of Contents (TOC) and customize them to their preference. 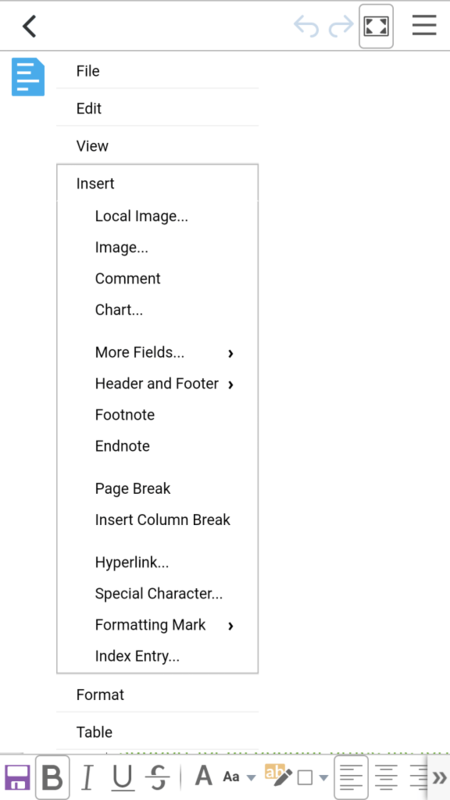 Adding a TOC to your documents easily provides an overview of a longer text based on the headings you have used helping readers to navigate through multiple pages easily and quickly. Use “Ctrl+Click Function” to jump to a heading or sub-heading in a document. 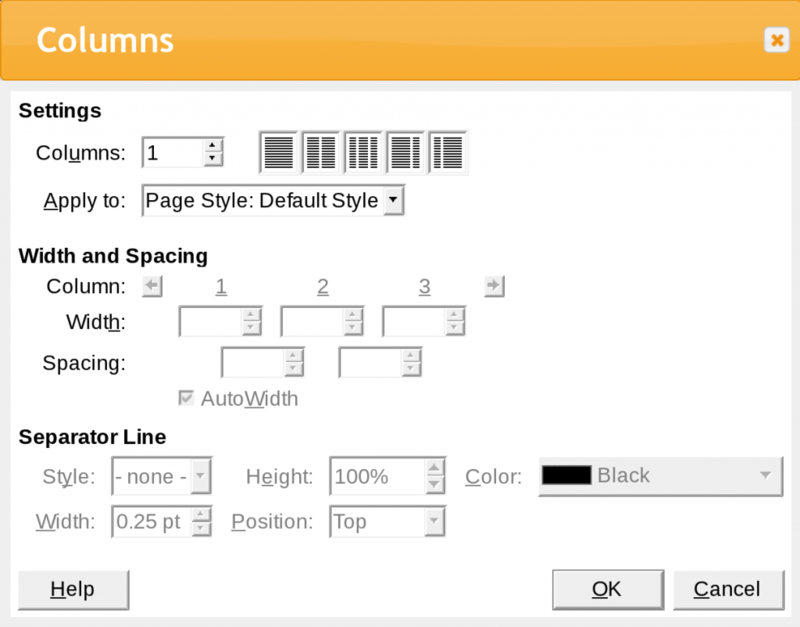 Calc uses page styles to specify the layout of how we print pages, including line arrangement, line styles, background colour, paper format, margins, layout setting, headers, footers, and shadowing styles. 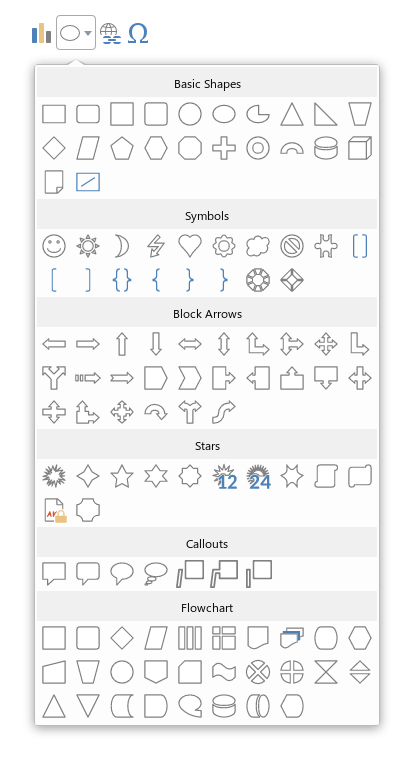 These are applied via page styles you can re-use for other sheets. In Impress, every slide is based on a slide master. Masters also exist for notes, and handouts. Every type of master has predefined areas for date, header, footer, and slide numbers whose styles can be customized. 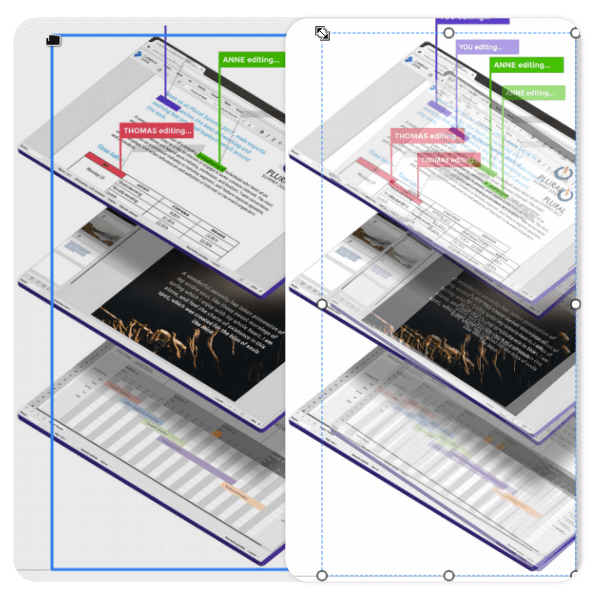 When editing online, to provide quick information about your contents, you need to be able to create, edit, and customize the Header and Footer as well as Bullets and Numbering features. Here’s some descriptions and screenshots of the dialogues. This feature allows you to create a header and footer for your slides, notes and handouts, without having to editing the Masters themselves. This allows rich customization of the position, type and size of bullets and numbering to create the ideal lists. 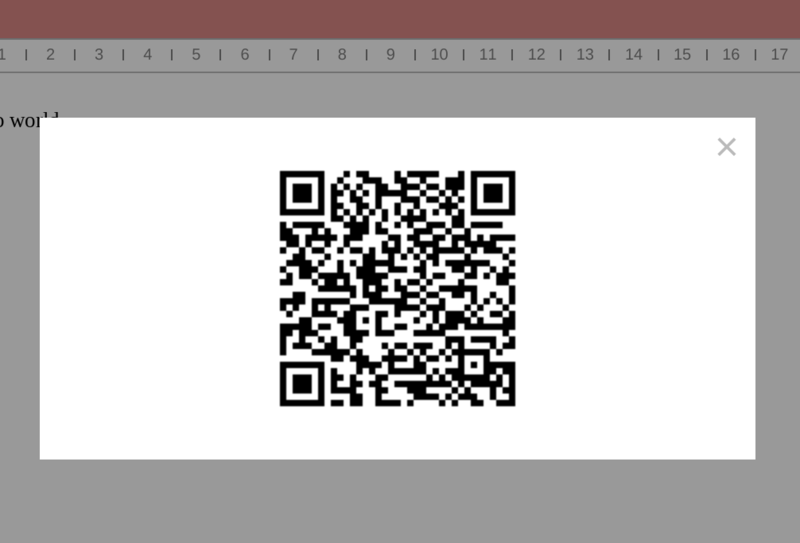 All the changes can be made using the Bullets and Numbering dialog box, which can be accessed through the Format menu. 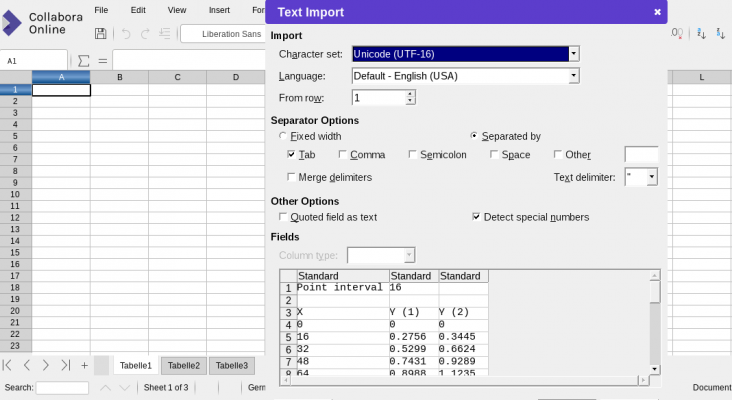 Security and document jail creation performance – particularly on stackable file-systems – has been significantly improved by removing all of the Collabora Office code from the document jails. 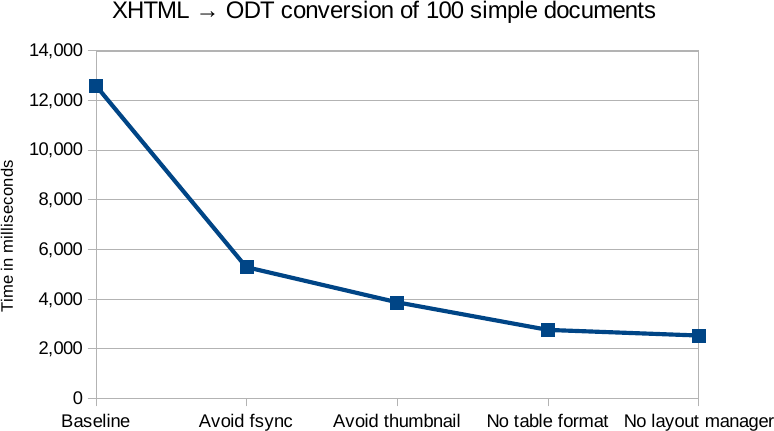 Improved Thumbnailing API via accelerated convert-to implementation, allowing easier file browsing. 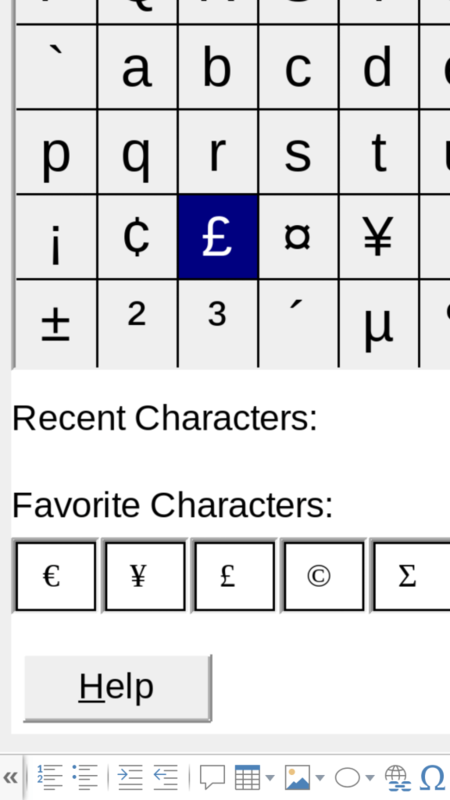 Translations have been expanded, thanks to the enthusiastic LibreOffice teams to include reasonable localizations to thirty-seven popular languages. 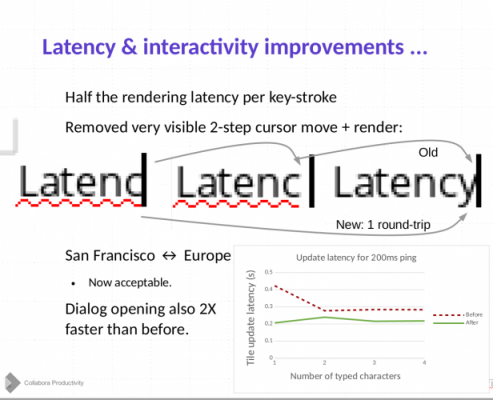 Improved interoperability – with many improvements to OpenXML (DOCX, XLSX, PPTX) support, support for new attributes, and wins for legacy SmartArt shapes without DrawingML fallback. As we come to Christmas and the new year, it is great to reflect on everything that we’ve achieved this year. Collabora Productivity would not exist without the funding, support and friendship of our partners and customers. When reviewing what we’ve achieved we’re really grateful for your trust & input into our product development, helping to guide which features and fixes we invest in next. Of course we could do nothing without our talented staff – who have worked extremely hard to turn your ideas into working code, alongside a wide community of volunteers. This release also brought change tracking management, a thesuarus, sorting and auto-filtering, IPv6 support, PAM integration, and much more. It formed the base for a series of incremental fix and improvement releases through the year. We also managed to include context menu spelling correction, column formatting, and a new scripting API for integrators. 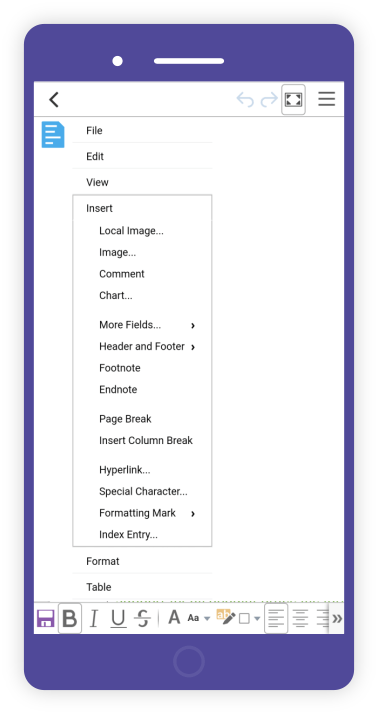 We also improved our mobile experience, impress slide-sorter performance, as well as allowing a configurable web root and other fixes. With a pair of 3.4.1 and 3.4.2 minor releases to further address partner issues. Every year, we refresh Collabora Office; our enterprise-grade, long term supported open-source office suite. 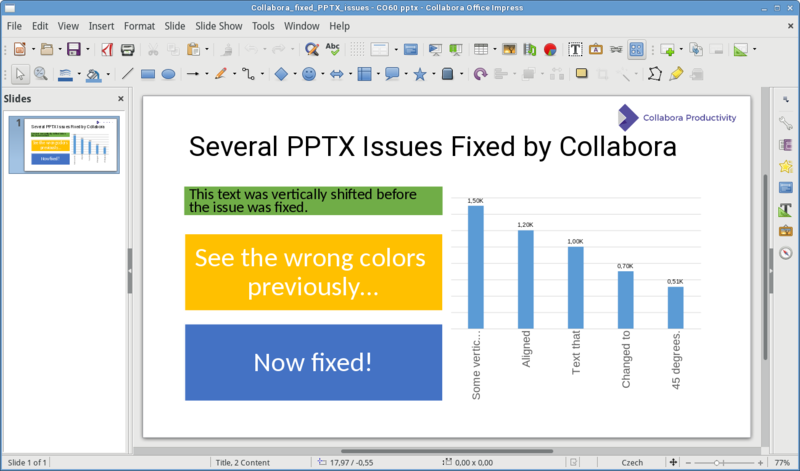 Collabora Office 6.0 brought a host of new features and interoperability improvements. After all the work on interoperabilty and our creation of an innovative new interoperbility tool: COLEAT, we called Collabora Office 6.0 The Migrator’s Choice. One of the major problems large enterprises often have is un-documented, legacy line of business applications often written in VB using COM to drive and re-use Microsoft Office. With Collabora Office 6.0 we have created a great new complementary interoperability tool: COLEAT that lets Collabora Office 6.0 act as a drop-in replacement via our compatibility APIs. It also implements a tracing tool to allow easy troubleshooting it complements our work making many more VBA macro driven documents work out of the box. Checkout a video of COLEAT in action. 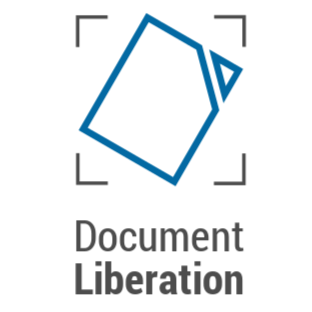 In 2018 – we deprecated the GovOffice brand, and made 5 years of support lifetime an option that can be ordered for Collabora Office. 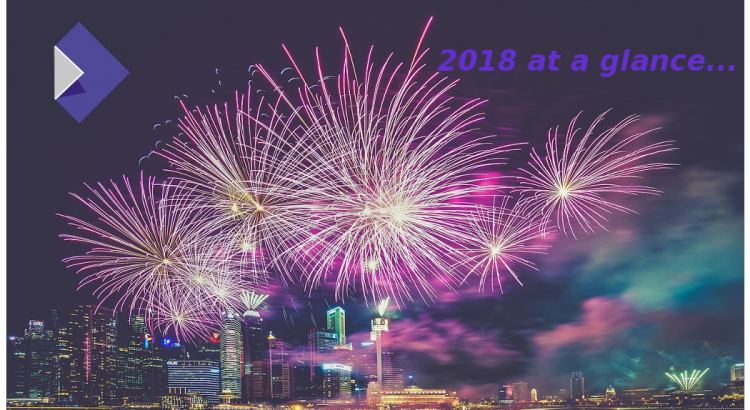 We included large numbers of features and fixes which we had implemented for our customers on top of LibreOffice 5.3 as well – from mail-merge, ADMX lock-down improvements, autotext import improvements, SharePoint lists / IQY import and much more. We continued to implement small new features and fixes on top of 6.0 through 2018 including a built-in MariaDB/MySQL connector, font effect transformations and other VBA and interoperability fixes as well as ongoing security updates. In 2019 we’ll be releasing Collabora Office 6.2 incorporating another round of Collabora and community development by mid 2019. Adding, and using lots of new options such as NoFileSync, NoThumbnail, HiddenForCovnersion, and lazy loading autoformat tables when they’re actually needed. Why not get involved in development using TestFlight and help us meet our goal of a good, Open Source, offline office suite solution in the first half of 2019.
the LibreOffice community (infographic). Serving with two seats on the TDF Board and Membership Committee, as well as being Advisory Board members. Thanks to TDF’s generous donors we significantly improved image handling inside LibreOffice, as well as working towards enabling Firebird migration in base. Thanks to AMD we’ve managed to hugely improve parallel CPU computation of large spreadsheets, and test all available bug documents with both threading and OpenCL to ensure great behavior in all known corner cases. We’ve also re-worked text rendering to avoid lots of redundant re-shaping of the same text – accelerating complex text locales. 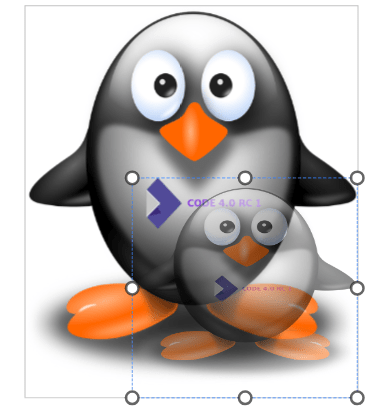 Working with SUSE, we have recently started to improve our support for SmartArt where shape fallbacks are missing, and making some progress towards sensible constraint-based layout of diagrams from Office files, follow Miklos’ blog for improvements working towards LibreOffice 6.3. We’ve also managed to fix large numbers of bugs, and continue to do large scale cleanups of the C++ core to make it easier to develop against – more detail than can fit in what started as a short write-up. Just a taste, a few screenshots and some pointers towards more details of what has been achieved. Thank you once again to all who worked with us as partners, customers who funded everything we do, and community who made it fun. We’re looking forward to achieving even more next year, if you’d like to get involved its easy to partner with us, buy from us, or to get involved in the community. And finally – thanks to the whole team that worked so hard to make it all happen. 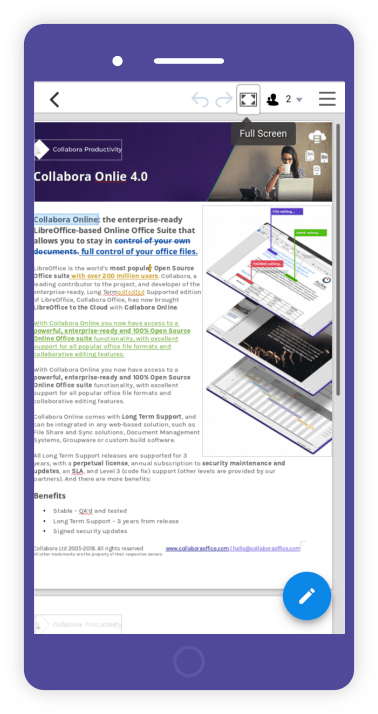 Cambridge, United Kingdom, December 18, 2018 – Collabora Productivity, the driving force behind bringing LibreOffice to the cloud, is excited to announce a release candidate of the new major release of CODE 4.0. This release includes a fresh look, mobile improvements as well as improved interoperability. 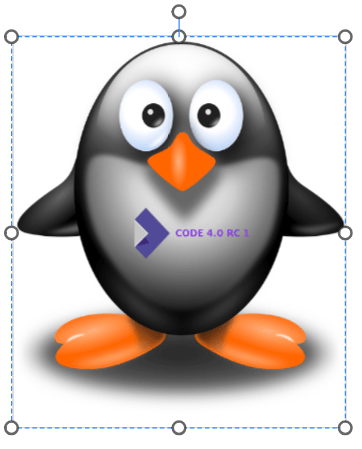 CODE 4.0 is a great way for early adopters, developers, customers, partners and home users to try out, and get involved with the latest development work, however it is not recommended to be used by organizations. We will be releasing our enterprise product Collabora Online 4.0 within weeks after iterating CODE and improving it based on feedback from our customers and partners. For more information see http://collaboraoffice.com/code. 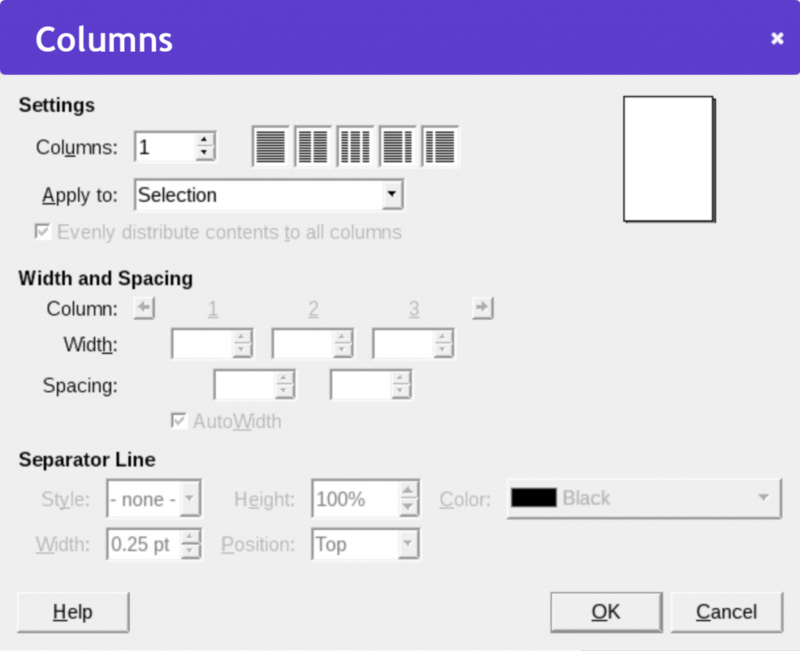 where the value true or false depends on the actual availability of the convert-to functionality depending on the configuration of the Collabora Online. The Save operation (in reality a PUT) can be annotated as having been triggered by all users leaving the document with an additional: X-LOOL-WOPI-IsExitSave header. EnableShare: Enables a menu item which triggers a postMessage called UI_Share. This postMessage can be handled to present a user interface element (like a sidebar or dialog) to configure sharing of the current file. 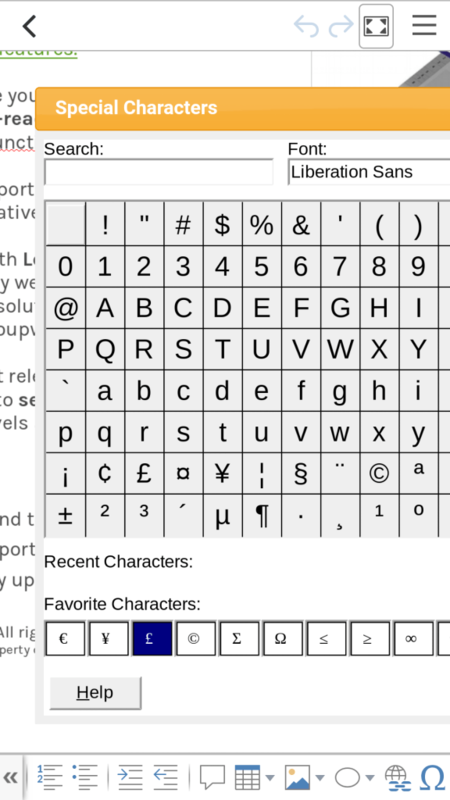 EnableInsertRemoteImage: Enable menu entry and toolbar item which trigger a postMessage called UI_InsertGraphic. This may be used to present a user interface element (like a dialog) allowing the user to pick an image from the integration. The integration is supposed to provide a temporary URL that may be downloaded once, and return it back via a postMessage Action_InsertGraphic with Values set to the temporary URL. DisableChangeTrackingRecord: Force recording of track-changes in the Writer document to off. DisableChangeTrackingShow: Force showing the tracked changes in the Writer document to off. HideChangeTrackingControls: Remove the change-tracking menu entries from the user interface. ObfuscatedUserId: In case the anonymization of logging is turned on, this ID is used in the logs instead of the real user names. NOTE: In production environments, the loglevel should _not_ be set to anything more verbose than WARNING anyway. UI_CreateFile: Requests WOPI host to open a new browser tab and create a new document. The document type is passed as DocumentType argument, and cand be ‘text’, ‘spreadsheet’, ‘presentation’ or ‘drawing’. When “Follow” is set to ‘true’ or is not defined enables following the editor, disables following when set to ‘false’. When “Follow” is set to true or is not defined, the “ViewId” parameter specifies user to follow. When “ViewId” is not defined, the current editor is followed. Cambridge, United Kingdom – December 06, 2018 – Collabora Productivity, the driving force behind putting LibreOffice onto the Cloud, and PowerFolder, a German-based file sync, share and backup solutions provider (aka dal33t GmbH) enter into a partnership agreement to ensure PowerFolder users have access to Collabora Online: the powerful, open-source and highly interoperable on-premise office suite in the cloud. 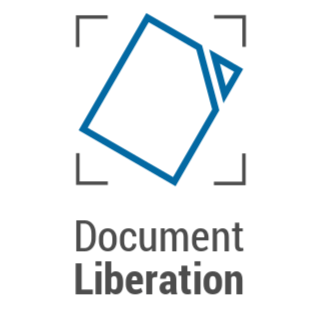 This partnership provides PowerFolder users with the opportunity of using Collabora Online – to work online on their documents, presentations and spreadsheets. 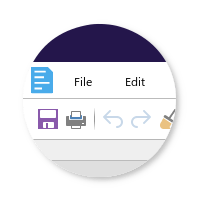 With Collabora Online integrated, documents can be edited directly in the cloud, without the cumbersome effort of having to download them or an Office program having to be started, with the document text never leaving your server. 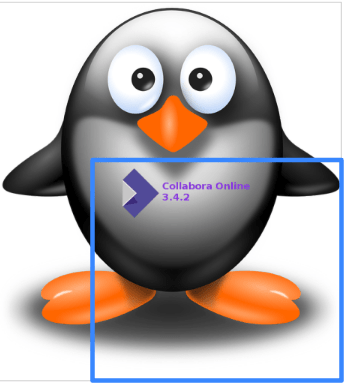 Collabora Online runs with all current browsers, without any need for additional plug-ins. It interoperates with all common office formats, such as .odt, .docx, .doc, .ods, .xlsx, .xls, or .odp, .pptx, .ppt and many more. The open source productivity application from Collabora Productivity can be used both in the cloud, as well as, if desired, also on-site, installed on clients’ own local servers, and thereby, optimally integrated into existing structures. The user interface can be also customized. In addition, the combination of PowerFolder’s support and Collabora Productivity’s SLA gives Collabora Online administrators the confidence to deploy today. 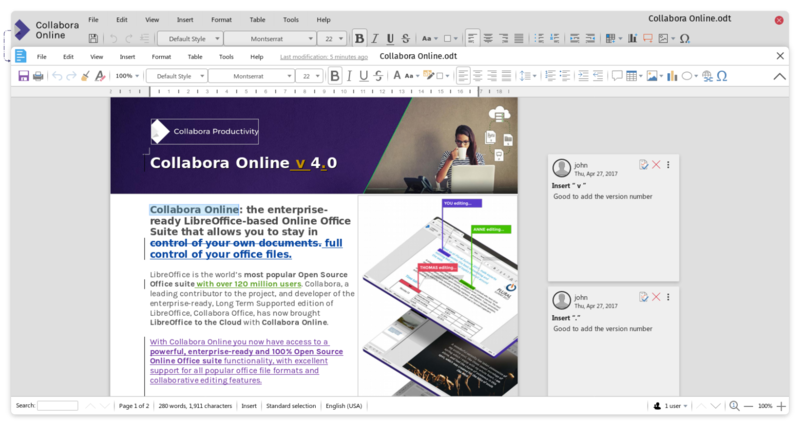 Collabora Productivity is the driving force behind putting LibreOffice in the Cloud, providing a range of products and consulting to enterprise and government. Powered by the largest team of certified LibreOffice engineers in the world, it is a leading contributor to the LibreOffice codebase and community. 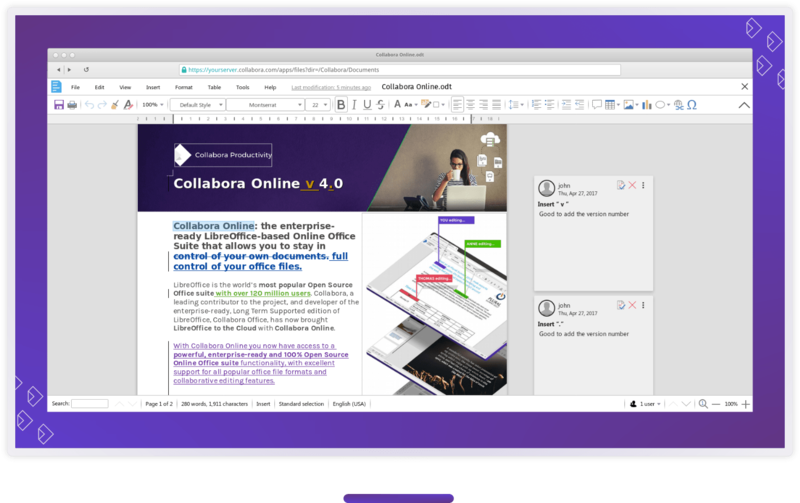 Collabora Office for Desktop and Collabora Online provide a business-hardened office suite with long-term, multi-platform support. 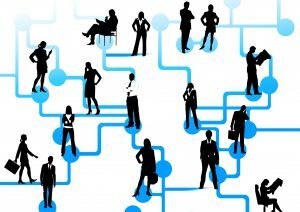 Collabora Productivity is a division of Collabora, the global software consultancy dedicated to providing the benefits of Open Source to the commercial world, specialising in mobile, automotive and consumer electronics industries. For more information, visit www.collaboraoffice.com or follow @CollaboraOffice on Twitter. 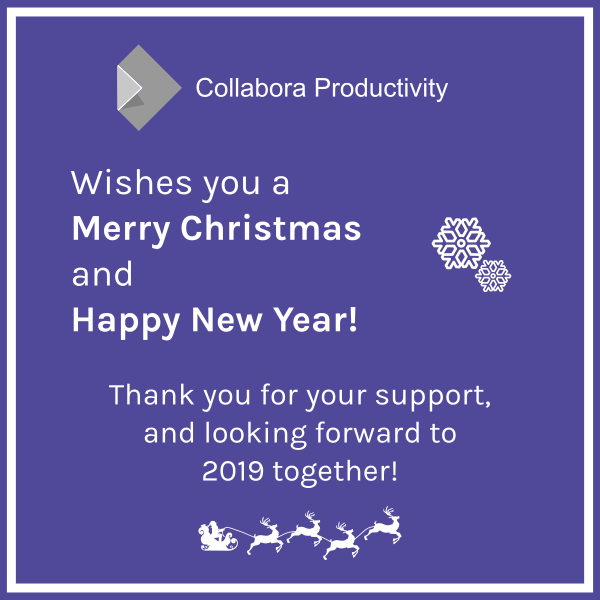 For more information, visit Collabora Productivity or follow @CollaboraOffice on Twitter. The German company dal33t GmbH, based in Düsseldorf, Germany, has been successfully developing and marketing file sync and share solutions under the brand name PowerFolder since 2007. Its offer includes both public and integrated private cloud solutions (EFSS) as individualized, on-premises services. More than three and a half million users worldwide, most of the German universities and thousands of companies use PowerFolder. With the PowerFolder app, users can access and share their files from anywhere in the world, even on the go. Security takes absolute priority: the data is always encrypted and stored on servers in Germany in compliance with the European Data Protection Ordinance (EU-GDPR). PowerFolder has the backing of the German Federal Ministry of Economics and carries the seal “IT Security Made in Germany”.